Welcome to the Manchester BIOGEL newsletter! Here, you can find out what we’ve been up to recently and our plans for the coming months. Julie is a Professor of Biomaterials and Tissue Engineering at The University of Manchester. 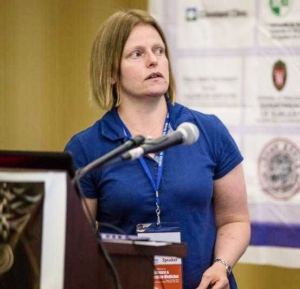 Her research focuses on tissue engineering of mechanically sensitive connective tissue such as bone, cartilage, skeletal muscle and the intervertebral disc. As such, Julie has worked with various novel hydrogels and various porous and fibrous materials as cell scaffolds to help achieve her research goals. Julie first started working with PeptiGels® in 2008 to explore their ability to host and proliferate chondrocyte cells for cartilage regeneration. More recently, Julie and her colleagues demonstrated that PeptiGels® have the potential to be used as therapy for oesophageal strictures, damage that can be caused when treating the precancerous condition Barrett’s oesophagus. Using PeptiGels®, the researchers were able to develop 3D co-culture model of rat oesophageal stromal fibroblasts and mouse oesophageal epithelial cells. This co-culture system was able to support the formation of a functional, uninterrupted, stratified epithelial sheet within seven days. Click here access the full paper. Julie is currently using PeptiGels® for culturing hepatocyte cells to develop model liver systems for toxicology testing. This summer has been filled with sunny skies and soaring temperatures, so much so that you could almost believe you were on holiday. But for our Summer Placement Student, Neraj, it was the first glimpse into the working world. 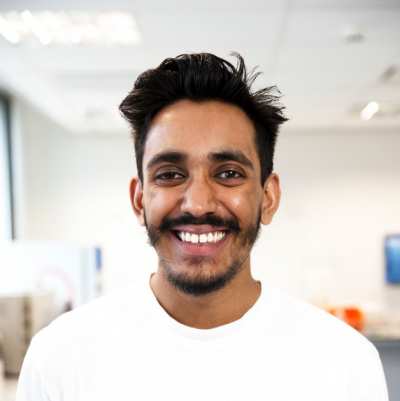 For his final year research project, Neraj worked in Professor Aline Miller’s group at the Manchester Institute of Biotechnology on the degradation of peptide hydrogels using protease enzymes. His hardworking attitude and friendly demeanour led him to successfully land a two-month paid placement with us at Manchester BIOGEL. Neraj joined the team in June, working with Mi on the development of our upcoming PeptiInk product range – more news about these coming soon. “The placement provided me a fantastic opportunity to progress and gave me a chance to naturally apply the skills that I had gained from my final year research project. The level of responsibility handed to me and the work carried out on a day to day basis felt very important and impactful in reaching the company’s targets. I really enjoyed the fact that my own creativity and ideas could be suggested and were encouraged to be implemented by the team – this was one of the most enjoyable aspects of working at Manchester BIOGEL. Neraj is now an Engineering and Technical Graduate at National Grid’s liquefied natural gas terminal situated on the Isle of Grain. We wish you the very best of luck in your chosen career Neraj! October is set to be a busy month for us here at Manchester BIOGEL; we’re flying over to Frankfurt at the beginning of the month to present at the Next-Gen Tissue Engineering and Regenerative Medicine conference on the 8–9th, then heading back to the UK for the Oxford Global Cell Series conference in London on the 25th. Both events attract the top biotech companies and internationally renowned academic institutions to disseminate and debate the latest developments and innovations in the tissue engineering and regenerative medicine field. Let us know if you’ll be at either of these events or come and say hello – it would be great to catch up. Alternatively, you can follow our activities on Twitter and LinkedIn. In November, we’ll be staying closer to home and leading a seminar at Alderley Park titled ‘Learning from nature to design self-assembling materials for regenerative medicine’. Come along at midday on Monday 5th November to find out about our peptide hydrogels and how and how our customers are using them in the life science field. It’s free to attend and there’ll be complimentary coffee too. Sign up here.